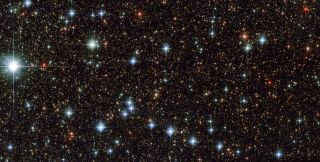 Part of the constellation of Sagittarius, known as The Archer, was imaged by the Hubble Space Telescope's Advanced Camera in fantastic details. Stars across the photo twinkle with reds, blues, silvers and golds. Thousands of stars and galaxies set a phenomenal backdrop in this Hubble Space Telescope image that includes a section of the constellation of Sagittarius. "The region is rendered in exquisite detail — deep red and bright blue stars are scattered across the frame, set against a background of thousands of more distant stars and galaxies," NASA officials wrote in an image description. "Two features are particularly striking: the colors of the stars, and the dramatic crosses that burst from the centers of the brightest bodies." NASA released the image on Jan. 19. "The crosses are nothing to do with the stars themselves, and, because Hubble orbits above Earth's atmosphere, nor are they due to any kind of atmospheric disturbance," NASA officials wrote in the description, adding that the crosses are caused by part of Hubble itself. "Like all big modern telescopes, Hubble uses mirrors to capture light and form images. Its secondary mirror is supported by struts, called telescope spiders, arranged in a cross formation, and they diffract the incoming light." The Hubble Space Telescope is a joint venture between NASA and ESA (European Space Agency). The telescope launched on April 24, 1990. After four servicing missions, the craft has worked for more than 25 years snapping images of the Universe for astronomers and scientists to study. Hubble has traveled more than of 3 billion (with a 'B') miles while orbiting Earth and has made more than 1.3 million observations.